Kurt Powdar Wins National Title, Beats Grant's Time! After a tough false start finish to his indoor season Kurt Powdar was on a mission. 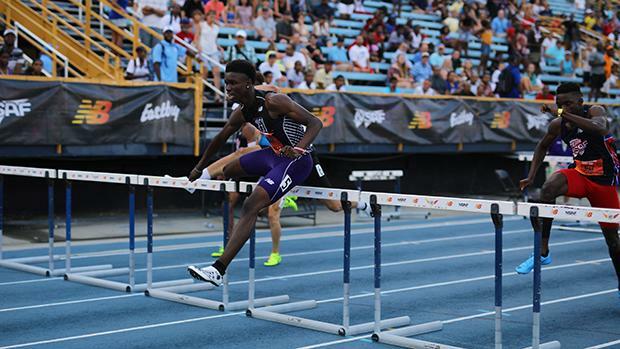 Outdoors he didn't want to make it even close and this afternoon that is exactly what he did to win the Boys 110mH national title. His time of 13.59 is a junior state record and VA #5 all-time. His coach Stan Holloway, Grant's father, just wanted him to relax and take care of business the way he knew Kurt could. He told him after indoors that everyone false starts and that it is just a part of track. That message definitely sunk in as Kurt was not afraid to get out strong today. Behind Kurt VA also had Daiqwaun Faircloth finishing in 8th in 14.19. Kurt also gave us the inside scoop to the five schools he is considering: LSU, Kentucky, OSU, Florida, USC.